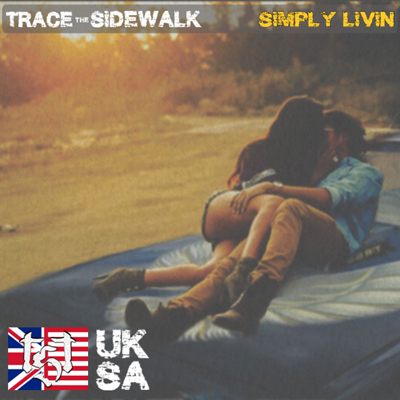 Life is easier when you're not trying to keep up with the Jones', and Simply Livin', the debut single release from Trace The Sidewalk, conveys that message with a catchy chorus, savvy lyrics, and a rockin' groove that delivers a "drive with the top-down", foot-tapping song that will move you from start to finish Trace The Sidewalk is an international collaboration of Dean Ferrito (United Kingdom) and Matthias Niehues (USA) delivering a unique blend of modern British and southern US rock styles. My humble musical journey began with a high school acoustic rock cover band, to weekly freestyling at local pubs, to making what seemed like endless demos, and then recording my first CD as a solo rap artist. I found my calling in the UK rock scene, joining local Rap/NuMetal bands, where I began establishing myself as a successful performer and songwriter, gaining local notoriety with the media and fans. After an almost career ending accident, I was forced to take a hiatus from the music scene to recover, during which time I focused on writing, recording, and establishing myself as a professional producer. Through dedication and hard work, I launched my own label, “Wunderkid Productions”, and released four consecutive albums with two different bands, “Lucky for Some” and “Route 77”. These projects have opened new doors in my musical journey, providing opportunities to strike up partnerships with numerous artists and executives, and helping me to reach my goals and dreams. I’ve had the pleasure of working with both established and world-renowned artists and producers, as well as aspiring unsigned acts. With a number of projects currently in production, my passion, drive and the love of music will ensure that these future releases will see the light. My main focus at the moment is “Trace the Sidewalk”, an ambitious rock project reuniting me with Matthias, a guest artist from a previous “Route 77” project, where I find myself producing the best music in my life. Enjoy the music, and thanks for being a fan! My name is Matthias, but I usually go by Matt. I was born in Bremen, Germany in 1971, and immigrated to the USA in 1978. I grew up in and around the Houston Texas area, and it was a storied childhood to be sure. Just me, my two brothers, and my mom, trying to live the American dream. There were some really tough times growing up, but we worked hard and played hard. I've got no complaints, no regrets, and I am truly blessed to live in this great country! I loved music when I was a kid, and loved to sing. I'd sit and listen to the radio all day, and Rock was my thing. I never really got into pop, rap, or R&B, though I did listen to a little country music. Actually, my first vinyl album was Kenny Rogers greatest hits, my second was AC/DC Highway To Hell. Some of my favorite bands and influences were Iron Maiden, Ratt, Creed, Loverboy, Bryan Adams, CCR, Def Leppard, Boston...and many many more. I didn't really get into playing music until my mid-twenties when I bought a set of drums. I played them consistently for a few years, but then life got really busy and I just didn't have time to play anymore. Now if for some odd chance there was a Karaoke night while I was out partying with my friends, I wouldn't hesitate to put my name on the list, but that was about the extent of my musical pursuits. In 2000, while galivanting with my buds on a Caribbean cruise, I met my future wife (and ironically, it was a Karaoke night that brought us together). We lived in Houston for a few years and then relocated to North Carolina, where I live today. We have 3 beautiful children and we have been enjoying life here in the beautiful foothills. I really wanted to get back into playing music again, and this time with a serious mind set. I sought out and joined a local rock band, playing mostly cover songs. I began writing lyrics and melodies for some originals we were working on and discovered that I really enjoyed creating original material, almost more than the singing. Our band eventually parted ways, but I still wanted to continue playing music, so I started browsing some of the numerous music collaboration websites to see what was out there. After sampling hundreds of songs, I really couldn’t find anything that I could connect with. But I was determined to keep searching...I really wanted to make something happen. Then I met Dean, and the rest is the future! Thanks for stopping by, and please like and share our page.